Opening Day for the Sodus Bay Lighthouse Museum’s 35th season! Blue skies and sunny afternoons on the deck - spring is here! Join us for a premium seated tasting of our newest vintages, expertly paired with tasty tidbits of specially selected food samples. Led by our fun and informative staff, our interactive premium pairing events offer a whole new dimension in wine tasting. You'll learn about our wines and winery, the Finger Lakes region, and how to pair food and wine. Tickets are required. Tastings are limited to a maximum of 12 participants, and start promptly at 3:00 PM. Please allow 1 hour for your visit. Wine Club members receive a 50% discount on tickets. Ready to have your seeing, hearing, smelling & tasting senses aroused? “COME EAT WITH US” at Finger Lakes Food Tours as we stroll through historic Uptown Canandaigua eating…exploring…and enjoying The Chosen Spot’s hot foodie scene with a professional “local” guide. Join us on opening day: May 3, 2019. 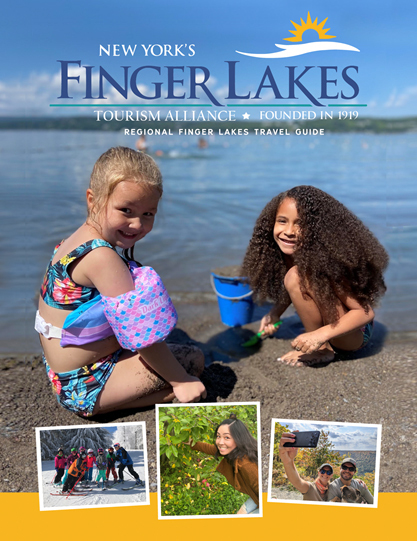 Founded in 1919, the Finger Lakes Tourism Alliance exists to enhance and promote visitor businesses for a 9,000 square mile region including the 14 counties of the Finger Lakes Region of New York State. The FLTA’s mission is to lead economic growth and development through exemplary promotion of the Finger Lakes Region as a world-class tourism destination. Recognized as the oldest regional destination marketing organization in the nation, the FLTA is also one of the longest-standing, continuously operating destination marketing organizations in the United States. Join us as a community of over 200 Finger Lakes friends, colleagues, and fans! Net proceeds from the gala will go to the Finger Lakes Tourism Alliance Scholarship Fund. For more information on subscriptions or concerts performed by the Orchestra of the Southern Finger Lakes at other area locations, please visit www.osfl.org. ​Motherhood thematically ties together pieces by Romantic composers. Take mom and the family out for a special treat this Mother’s Day. Everything is provided for you so there is no worry about planning a meal; just sit back and enjoy time with mom, family and friends. Mothers support us, care for us, and bring out the best in us all year long. This Mother’s Day, join us in Aurora for a special three-course dinner designed to express our gratitude for all that mothers do for us. Celebrate Mom with Brunch at Sapalta at Plum Point Lodge. This buffet style brunch with Chef Brud Holland will delight your taste buds with Finger Lakes inspired cuisine. Reservations are strongly encouraged . Please contact natalie@plumpointlodgeflx.com for booking and details. Give Mom a well deserved day off by treating her to our annual Mother's Day Brunch! This year we are hosting an upscale Buffet Brunch in the Small Barn, where you can fill up on fancy dishes and traditional brunch faves like scrambled eggs, home fries, bacon, sausage & ham, fruits, pastries, and much more. The Buffet is $25 per person with your choice of mimosa (if you're over 21) or sparkling grape juice, $13 for kids under 13 with sparkling grape juice. And, each Mom gets a carnation as our way of saying thanks for everything you do for us! Reservations are required, so call the Café at 607.387.6804 or Winery at 607.387.6801 to reserve a table at the time you prefer. The programs are held on the second Monday of each month, introducing a new topic or theme each time, frequently paired with art-making, music and refreshments. Meet Me at the Museum is a free program; registration is strongly encouraged – please contact the Alzheimer’s Association by calling 800.272.3900. We look forward to making memories with you! Receive a FREE gift with paid admission. Open 12 to 5 p.m. Admission: $6/Adult; $3/Students (K-12); FREE for Preschool Children & SBHS Members. On a hot summer afternoon in a New York courthouse a jury must decide whether or not to reach a guilty verdict and sentence a 19-year-old to death. In this seminal American jury room classic, jurors deliberate a case and reveal their biases, weaknesses and strengths, while highlighting the complex U.S. justice system. The Seneca Lake Wine and Food Festival will celebrate some of the best the Seneca Lake area has to offer. Featuring over 200 wines to choose for sampling, along with food vendors, live music and waterfront views for you to enjoy! This event is generously co-sponsored by the Watkins Glen Area Chamber of Commerce. Cruise'n Time will be at The Windmill to cohost the annual Spring Car Show. Bring your classic car to enter in the show or just come to see all the vintage "iron". While you are there enjoy all the great shopping and endless food options! The Lion's Club will be in the large gazebo conducting free vision screenings for kids. GPS Band will entertain from 11:30 to 1:00. The most unique race course around – through nature trails and the Historic Village, all kicked off by firing a 100-pound anvil high into the air! Whether you’re running or power-walking, this chip-timed race will be one to remember. Post-race activities include museum admission for the day, photo ops, refreshments, and awards! Plus your entrance fee goes to support the museum and its mission. Registration available; walk-ins accepted. NEW THIS YEAR! FREE Kids' Fun Run! Learn the art of blending and how the process produces a balanced and layered final product with winemaker, Barry Tortolon. Ticket is $20/person and includes hands on experience & light hors d’oeuvres. 1 pm and 3 pm time slots are available. The Ravinous Kitchen is back for the season! Join us at the Ravinous Tasting Table in our Ravines Wine Cellars Slate Barn in Geneva. The Tasting Table will be happening every Saturday and Sunday from this weekend forward, throughout the summer! Starting in June, tasting tables will happen twice on Saturdays, at 11:30am and again at 2pm and on Sundays at 1pm. Find more details and book by clicking on the link that takes you to the Ravinous Kitchen page on our website. Sodus Bay Lighthouse Museum is participating in the Blue Star Museum Program, offering free admission to active-duty military personnel and up to five family members. Open Tuesday through Sunday (and Monday holidays). GlassFest is four days of glassmaking demonstrations, music entertainment, art & craft vendors, shopping, food, and more! GlassFest kicks off on Thursday night with the Glass Ribbon Cutting Ceremony and 2300°: GlassFest (https://www.cmog.org/programs/2300) free and open to the public, held at the Corning Museum of Glass featuring live glassmaking, music entertainment, shopping, food, and drink. Friday at the Rock The Park concert in Riverfront Park. Spend all day on Saturday and Sunday wandering along Historic Market Street, which is closed to car traffic and filled with art and food vendors. Watch live glassblowing demos on the outdoor stage in Centerway Square, listen to music during Rock The Park on both days, enjoy activities for the whole family, and even stay late for fireworks on Saturday night! For more information on GlassFest call (607) 937-6292. Class sizes are limited so reserve your spot online or by calling 315-536-4616. Tickets: $45 + tax. Let ATLYS take you on a voyage around the globe! including Sia, Bjӧrk, and Beyoncé. Alec Myth Trio will peform at The Windmill with their high energy performance. Their musical influences include Jerry Garcia to Neil Young, The Allman Bros. to Otis Redding, Van Morrison and The Beatles. Join us once a month, on Sundays, throughout the season for Paella on the Patio! Our chef prepares Authentic Spanish Paella on our patio with our famous view as the backdrop. Come early to watch the process from beginning to end and get your palates wet with a bottle of wine and some of our Authentic Spanish tapas as the delicious smells of paella fill the air. We have a list of local musicians lined up, one for each date - May 26th w/ The Influence! Music begins at 1PM. Wondering what Paella is? Visit us in the tasting room to find out! Don't miss your chance to visit Doc McStuffins: The Exhibit! Help Doc perform check-ups and diagnose toy patients, treat them in the magical McStuffins Toy Hospital, perform procedures in the Operating Room, and more. Included with general museum admission fees. Open Memorial Day for all of the Holiday visitors to the Finger Lakes! High Country Band will perform from 11:30 to 1:30 and the Dundee Fire Department will be raffling a bicycle with a fire truck on display. joined by GMF favorites Jinjoo Cho and Michelle Cann. Budbreak and flowering celebrates the new green beginning to the vintage. A wine educator will lead you through several vineyard sites where you will learn the innovative grafting technique that our founder brought to the Finger Lakes, the parts of the vine, what happens during budbreak, and why flowering is so important. At each vineyard site you will taste its respective wine. At the conclusion of the tour, a seated flight of wines are paired with the chef’s seasonal creative bites.